Lakes Environmental Association What is milfoil? 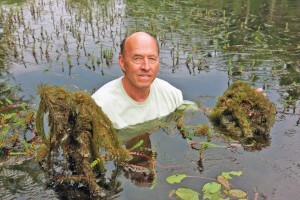 Watermilfoils are rooted, submerged aquatic plants found naturally in lakes and streams. Five varieties of watermilfoils are native to Maine and are part of the natural lake ecosystem. Two non-native watermilfoils threaten the quality of Maine fresh waters; Variable leaf milfoil (myriophyllum heterophyllum) is already present in 27 Maine lakes systems, including streams. 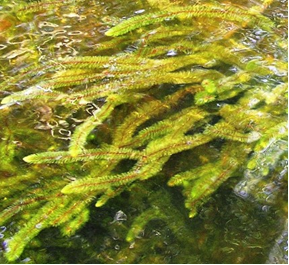 Eurasian watermilfoil (myriophyllum spicatum), the more aggressive colonizer of the two, has been found in several Maine water bodies. Where do they come from and how do they spread? All invasive species have a native habitat somewhere, many invasive aquatic plants were first transported as ornamental aquarium plants. When aquaria were emptied into lakes or streams, the plants proliferated in their new environmenat. Variable leaf milfoil was first recorded in Maine in 1970 in Sebago Lake. 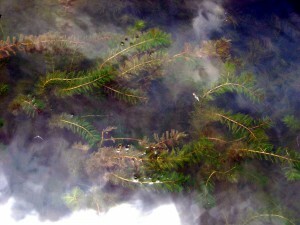 Variable leaf and eurasian milfoil can reproduce by fragmentation. When a disturbance like motorboat or fishing lure passes through a colony of plants, the chopped up pieces are each capable of forming a new plant. Milfoil can move from lake to lake on a propeller, trailer, fishing gear or anchor. Why are invasive plants so bad? Much of Maine’s economy is based on recreation and tourism; Maine’s lakes bring in $2.3 billion dollars annually into Maine’s economy. The visitors to those lakes spend a total of $3.5 billion in Maine each year, $1.8 billion of which goes directly to the income of Maine residents at 50,000 jobs statewide. The dense growth and rapid spread of milfoil along lake shores dramaticly impedes swimming and fishing. As the quality of our waterways decline people are less likely to visit them. Additionally, a 2001 Maine DEP report states that if Maine suffers infestations even of a ‘fraction’ as severe as of those in Vermont than lakefront landowners can expect an avaerage property devaluation around $12,000. Ecological impacts of invasive plants are difficult to enumerate. The most obvious impact they have upon native communities is out competition. In an organism’s native habitat its growth and spread are balanced by other organisms that have evolved to compete with or eat it. Invasive plants like variable leaf milfoil are free from their natural competetors and can out compete native plants for space and sunlight. The implications of the loss of native plants are far reaching. Native plants act as both a food source and habitat. By changing the available habitat and food source invasive plants can drastically alter delicate relationships in the food web. What can you do about the threat of milfoil? Educate others. Tell your friends and neighbors about the threat, especially if they are a boater who might inadvertently spread the plant. Volunteer with a Coutesy Boat Inspector program. Lake protection groups in Maine, including LEA, are always looking for dedicated volunteers to help educate boaters and check boats for plants. Always remove all plants from your boat, trailer, fishing gear and anchor when going in and out of a body of water.